Mrs. Noah: "Two - Noah, are you sure?" Noah: "Of Course I'm sure, dear!" Mrs. Noah: "Two of each kind, Noah?" Noah: "Yes, two of each kind!" Mrs. Noah: "How do you know that?" Noah: "Because that's what I heard him say! Remember the ark?" Mrs. Noah: "Remember? Noah, how could I forget it. It's all you and my boys have been doing, building that ark. A gigantic boat - BUT - No lake - No river - No ocean nearby. Years of cutting and hauling wood and then the building. Most wives get a house. I get an ark! Do you know how many people are laughing at us?" Noah: "Look, we've been through this before. I told you God came to me and said, 'I WANT YOU TO BUILD ME AN ARK!' When I asked him why, he said he was going to destroy the world!" Noah: "You had faith then. You believed me. So why doubt me now when I told you he said, 'Go into the world and gather two of each kind of creature - male and female and bring them into the ark.'" Mrs. Noah: "Well, there's two problems that I see." Mrs. Noah: "Those are two boy dogs you just put into that cage." Noah: "Hey, guys - take one of these dogs out and bring me a girl dog of the same species. Which one goes out? The one that bit me, That's which one. No biters on this ark. Mrs. Noah: "Ok, second problem. You said two of each kind of animal?" Mrs. Noah: "Well, one of our sons just brought in seven pairs of the same kind of birds and seven pairs of some of the other animals." Noah: "Oops, forgot to tell you about that one. God said to bring more of the birds and some of the clean animals. We're supposed to use them for food and for sacrifices." Mrs. Noah: "You didn't forget to tell me anything else?" Noah: "Not that I remember. Okay, Shem, Ham, Japheth kids - get your wives on board, and we'll get this thing closed up." It was then that another true test of faith began. 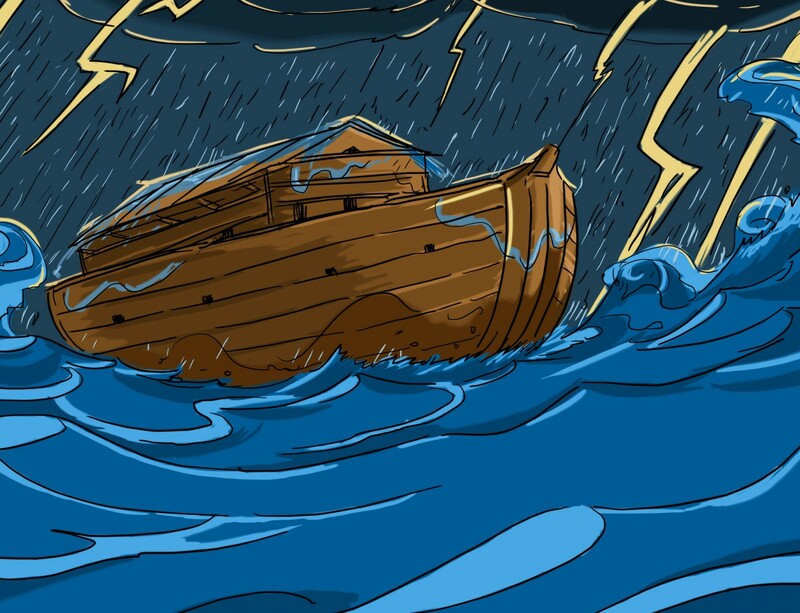 It was seven days in the closed up ark before the rain began to fall and the earth opened up to let the waters below flood the earth. The rain came down, and the floods came up. It then rained for forty days and forty nights. By the time the rains stopped, the world, as they knew it was gone. But, Noah, his wife, his sons and their wives were saved because Noah wholeheartedly loved and obeyed God. People have heard about the ark. People have heard about the flood. People all know about the animals 2 X 2. But most of us need a reminder, just like Noah's wife did about the extra animals on board. And when the flood had receded, God made a promise that he would never again destroy the entire world with a flood. He put the rainbow in the sky as a sign of this promise. Everyone who sees the rainbow can remember God's promise and enjoy the beauty He has created for us.